(2) Kataoka T, Kokubu T, Muto T, Mifune Y, Inui A, Sakata R, Nishimoto H, Harada Y, Takase F, Ueda Y, Kurosawa T, Yamaura K, Kuroda R. Rotator cuff tear healing process with graft augmentation of fascia lata in a rabbit model. J Orthop Surg Res. 2018 Aug 13;13(1):200. doi: 10.1186/s13018-018-0900-4. (3) Ueda Y, Inui A, Mifune Y, Sakata R, Muto T, Harada Y, Takase F, Kataoka T, Kokubu T, Kuroda R. The effects of high glucose condition on rat tenocytes in vitro and rat Achilles tendon in vivo. Bone Joint Res. 2018 Jun 5;7(5):362-372. 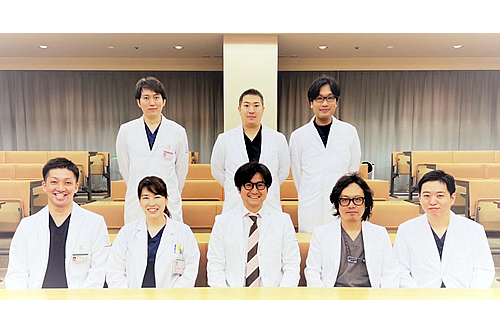 (4) Takase F, Mifune Y, Inui A, Ueda Y, Kataoka T, Kokubu T, Kuroda R. Association of advanced glycation end products in Dupuytren disease. J Orthop Surg Res. 2018 Jun 7;13(1):143. doi: 10.1186/s13018-018-0848-4. (5) Kawakami Y, Takayama K, Matsumoto T, Tang Y, Wang B, Mifune Y, Cummins JH, Warth RJ, Kuroda R, Kurosaka M, Fu FH, Huard J. Anterior Cruciate Ligament-Derived Stem Cells Transduced With BMP2 Accelerate Graft-Bone Integration After ACL Reconstruction. Am J Sports Med. 2017 Mar;45(3):584-597. (6) Nishimoto H, Inui A, Ueha T, Inoue M, Akahane S, Harada R, Mifune Y, Kokubu T, Nishida K, Kuroda R, Sakai Y. Transcutaneous carbon dioxide application with hydrogel prevents muscle atrophy in a rat sciatic nerve crush model. J Orthop Res. 2017 Nov 28. doi: 10.1002/jor.23817. (7) Kokubu T, Mifune Y, Inui A, Kuroda R. Arthroscopic Rotator Cuff Repair With Graft Augmentation of Fascia Lata for Large and Massive Tears. Arthrosc Tech. 2016 Oct 31;5(6):e1235-e1238. (8) Muto T, Kokubu T, Mifune Y, Inui A, Sakata R, Harada Y, Takase F, Kurosaka M. Effects of platelet-rich plasma and triamcinolone acetonide on interleukin-1s-stimulated human rotator cuff-derived cells. Bone Joint Res. 2016 Dec;5(12):602-609. (9) Mifune Y, Inui A, Sakata R, Harada Y, Takase F, Kurosaka M, Kokubu T. High-resolution ultrasound in the diagnosis of trigger finger and evaluation of response to steroid injection. Skeletal Radiol. 2016 Dec;45(12):1661-1667. (10) Takase F, Inui A, Mifune Y, Sakata R, Muto T, Harada Y, Ueda Y, *Kokubu T, Kurosaka M. The effect of platelet-rich plasma on degeneration change of rotator cuff muscles: In vitro and in vivo evaluations. J Orthop Res. 2016 Sep 29. doi: 10.1002/jor.23451. (11) Inui A, Nishimoto H, Mifune Y, Kokubu T, Sakata R, Kurosaka M. Ultrasound measurement of median nerve cross-sectional area at the inlet and outlet of carpal tunnel after carpal tunnel release compared to electrodiagnostic findings. Arch Orthop Trauma Surg. 2016 Sep;136(9):1325-30. (13) Kawakami Y, Matsumoto T, Mifune Y, Fukui T, Patel KG, Walker GN, Kurosaka M, Kuroda R. Therapeutic Potential of Endothelial Progenitor Cells in the Field of Orthopaedics. Curr Stem Cell Res Ther. 2016 Aug 10. (17) Muto T, Kokubu T, Mifune Y, Inui A, Sakata R, Harada Y, Takase F, Ueda Y, Kuroda R, Kurosaka M. Can Platelet-Rich Plasma Protect Rat Achilles Tendons From the Deleterious Effects of Triamcinolone Acetonide? Orthop J Sports Med 3(7), 2015. (18) Sakata R, Kokubu T, Mifune Y, Inui A, Nishimoto H, Fujioka H, Kuroda R, Kurosaka M. A new bioabsorbable cotton-textured synthetic polymer scaffold for osteochondral repair. Int Orthop 38(11): 2413-20, 2014. (19) Nagura I, Kanatani T, Sumi M, Inui A, Mifune Y, Kokubu T, Kurosaka M. Management of intolerance to casting the upper extremities in claustrophobic patients. ScientificWorldJournal 2014: 803047, 2014. (20) Muto T, Kokubu T, Mifune Y, Inui A, Harada Y, Yoshifumi, Takase F, Kuroda R, Kurosaka M. Temporary inductions of matrix metalloprotease-3 (MMP-3) expression and cell apoptosis are associated with tendon degeneration or rupture after corticosteroid injection. J Orthop Res 32(10): 1297-304, 2014. (21) Kanatani T, Nagura I, Kurosaka M, Kokubu T, Sumi M. Electrophysiological assessment of carpal tunnel syndrome in elderly patients: one-year follow-up study. J Hand Surg Am 39(11): 2188-91, 2014. (22) Harada Y, Kokubu T, Mifune Y, Inui A, Sakata R, Muto T, Takase F, Kurosaka M. Dose- and time-dependent effects of triamcinolone acetonide on human rotator cuff-derived cells. Bone Joint Res 3(12): 328-34, 2014. (2) Takase F, Yamasaki K, Kokubu T, Mifune Y, Inui A, Kuroda R. Treatment of Chronic Bony Mallet Fingers by Dorsal Extension Block Pinning with Percutaneous Curettage. Case Rep Orthop. 2018 Nov 21;2018:7297951. doi: 10.1155/2018/7297951. eCollection 2018. (3) Nagura I, Kanatani T, Sumi M, Kokubu T, Kurosaka M. Recurrence of Enchondroma in a Middle Finger after Curettage and Back-filling with Calcium Phosphate Bone Cement: a Case Report. Kobe J Med Sci. 2016 Jun 16;62(1):E19-21. (4) Mifune Y, Inui A, Takase F, Ueda Y, Shinohara I, Kuroda R, Kokubu T. Two Extension Block Kirschner Wires' Technique for Bony Mallet Thumb. Case Rep Orthop. 2016;2016:8086594. (5) Inui A, Suzuki T, Kokubu T, Sakata R, Mifune Y, Kurosaka M. Carpal Tunnel Syndrome Caused by Tumoral Calcinosis. Case Rep Orthop.170873, 2015. (6) Inui A, Kokubu T, Mifune Y. Volar dislocation of index and middle finger carpometacarpal joints: a case report. J Hand Surg Eur 40(1): 99-100, 2015. (7) Nagura I, Kanatani T, Sumi M, Inui A, Mifune Y, Kokubu T, Kurosaka M. Management of intolerance to casting the upper extremities in claustrophobic patients. ScientificWorldJournal. 2014;2014:803047. doi: 10.1155/2014/803047. (8) Takase F, Inui A, Mifune Y, Muto T, Harada Y, Kokubu T, Kurosaka M. Concurrent rotator cuff tear and axillary nerve palsy associated with anterior dislocation of the shoulder and large glenoid rim fracture: a "terrible tetrad". Case Rep Orthop : 312968, 2014. (9) Kanatani T, Fujioka H, Kurosaka M, Nagura I, Sumi M. Delayed electrophysiological recovery after carpal tunnel release for advanced carpal tunnel syndrome: a two-year follow-up study. J Clin Neurophysiol. 2013 Feb;30(1):95-7. doi: 10.1097/WNP.0b013e31827ed839.